This article deals with White Balance. You need to help your camera find what is really white to start with. You really, really, really need to do this! 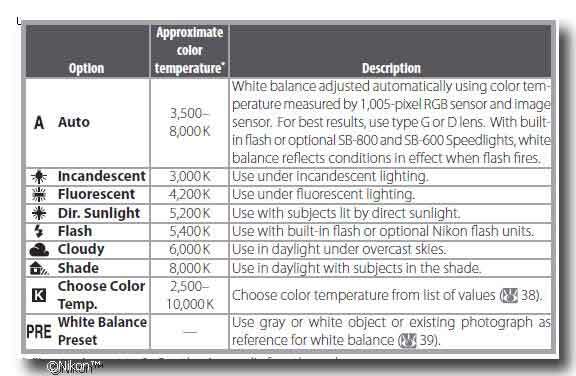 WHITE BALANCE is what the camera uses to determine what a color is. For instance, in a room lit with regular light bulbs, it is called incandescent or “tungsten” lighting. The light is naturally on the amber/yellowish side. If your camera is set for daylight pictures, your photos inside the room are all going to have a rather unpleasing and in-accurate amber/yellow cast. A wall painted white or a white dress will not look the best if amber/yellow. We do not do weddings at Thomas Haynes Photography and don't have to worry about the dress looking right for everyone, whew! Walls being the correct color, that we do have to get right. If camera thinks amber/yellow is white and decides how other colors look from there…what a mess that will be. You already know how to fix that! I do not mean Photoshop™ or Paint Shop Pro™ or other software. Sure, software will let you adjust color but why spend so much time doing that and still not getting it exactly right when you, smarter than your camera, can tell your camera which colors are accurate to start. Then and only then use software to fine tune it all. You put the camera setting on AUTO for white balance or you select that little light bulb symbol for “incandescent”. Is that it? Either way, you photos will now be much closer to accurate color. Look at your photos. Auto might have done ok but the setting for incandescent did not do so well this time. What happened to the color? Mixed lighting is the culprit…daylight from the windows, funky color from spiral fluorescent bulbs, a halogen track light here and there—a mix too jumbled for basic incandescent camera settings to correct. But, there is a better way to do it and most digital cameras have this option: Custom or Preset white balance. “Read the manual” is good advice and is how you will learn to make a custom white balance for the room you need to photograph. While different cameras use different instructions, buttons or knobs to set white balance, the basic event is the same. Take a photo of a white sheet of paper or white foam core board. The camera is set to use this reading as the starting point for “what is actually white”. All the kinds of light in the room are taken into account because that is what is lighting the white card. 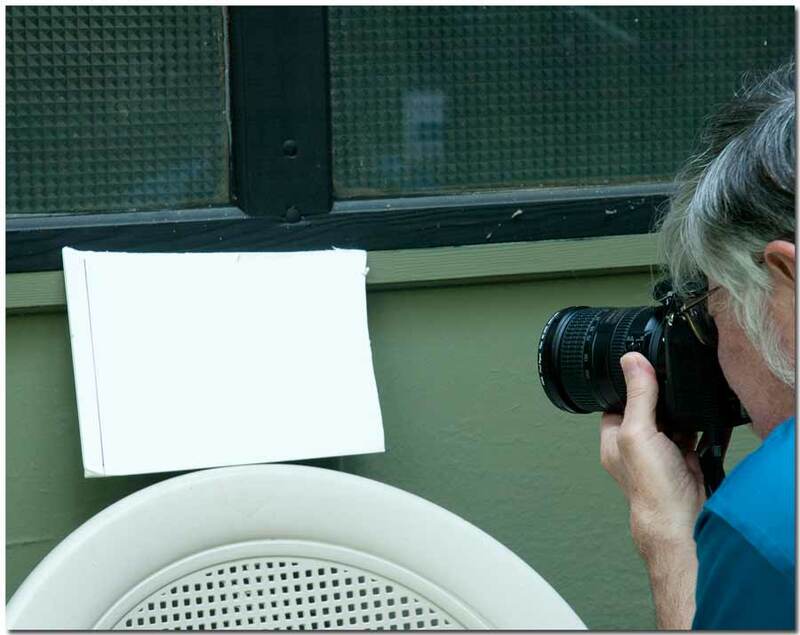 Using a white card to set camera white balance: In this instance, the green paint of the house was showing as light gray and preset white balance was needed for accurate color. To set "pre" white balance on the Nikon DSLR cameras we use, the white balance setting is moved from Auto all the way over to PRE. The white balance button is pressed and soon enough the word “pre” begins to flash in the control panel on top of the camera. Then, a photo is shot of the white paper or card. If the camera gets a good reading, the word “good” shows in the panel. Keep the white balance set on pre and you are good to go for all the situations with lighting like in the place you did the custom white balance setting. This IS more accurate than Auto because it literally uses the available lighting and the white photo to set a correct starting point (white) for other colors in your photographs. Note, the white does not need to totally fill the view and does not need to be in focus. Believe it..When Thomas Haynes Photography heads out of Clinton, Tennessee to shoot photos for a client, before any photos are taken we set the preset white balance for the scene. Remember, by all means change the white balance when you move into a scene or room with totally different lighting or go outside. Auto generally works acceptably outside and in many interior situations where lighting is relatively uniform. Try preset or custom white balance to get you out of color trouble in difficult lighting and overall better color rendition by the camera. 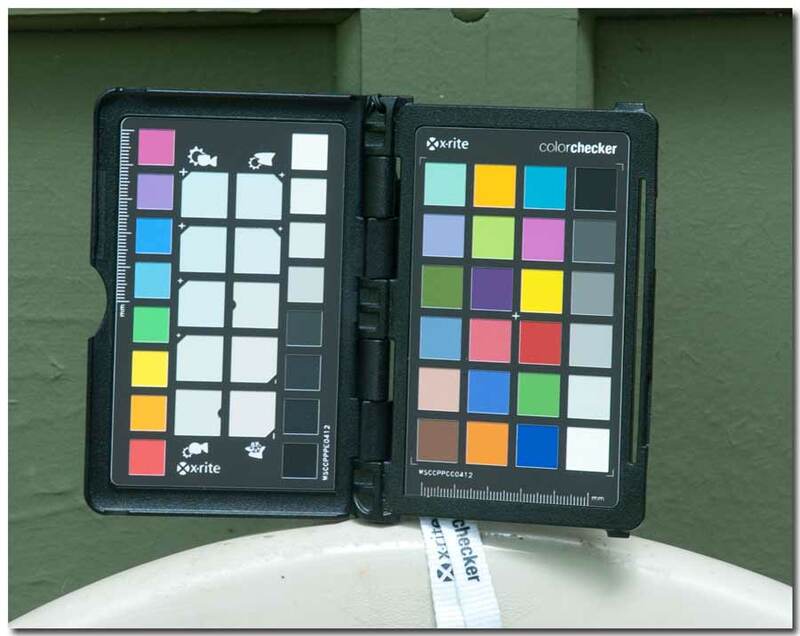 Color Checker Passport by Xrite, used for accurate color rendition from camera to computer editing. "White Card" section of Color Checker Passport, designed for proper light reflection. While we consider a color reference such as the XRite products Passport totally necessary to get accurate color critically accurate, simply using a custom or preset white balance from a white sheet of printer paper or sturdier white foam core board will work a small miracle in difficult lighting situations. You can do it...if you would rather spend your time with clients and not so much with a camera and editing software, drop an email to Thomas Haynes Photography using the email box at upper right of the blog page. We will respond and meet with you as you wish. We work in the greater Knoxville area of east Tennessee, out of Clinton. Email us and a we may begin a conversation on normal email where you are not limited to the blog page text box. Send questions,brag on us(yes!) honestly, make comments, any way you choose to open the door to communication. This can be a win for both of us. You can even have us to do the photos. We have no connection with makers or sellers of any of the products we mention in this blog. We do not get a single cent but mention products as appropriate to the article. Oops,ran out of time and space but will get into using shadow, contrast and saturation via your computer software in the next post. An article is being written to cover basics of color capture and editing, with suggestions on adjusting shadow and contrast to improve depth and attractiveness of your photographs. See UPCOMING TOPIC on the right for more info on what Thomas Haynes Photography has planned in the future on the Photoshoot blog. Contact us as you wish and we will arrange to meet and talk about photo services with the working range out of Clinton in the greater Knoxville, Tennessee area. 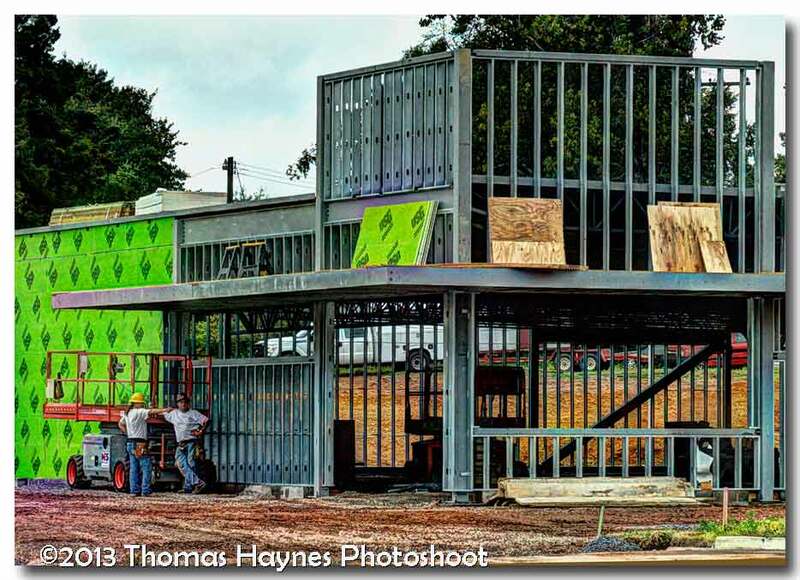 Job site photographs serve several purposes to benefit contractors, equipment manufacturers, architects, insurance providers, project developers and financial backers. While a builder may use a string of photos or time lapse video to record daily progress, that is not the type of photo work we do. The sort of job site photography we do is planned from the start to serve as a marketing tool and showcase for what you do as developer, architect or contractor. For the sub-contractor, we use photography to visually emphasize the particular work you do. Aldi's Grocery construction in Oak Ridge, Tennessee, photo shot from public access near the job site. Visual images from the job site catch the attention of viewers to promote and sell the developer, contractor services, equipment and even promote job opportunities. Publicity releases generate interest and anticipation of project completion. Via Internet and print, developers reach out beyond a sign on the property to a wider audience. While large photographs may be on the walls of the developer’s office, smaller and specific photos are planned and tailored as part of a marketing effort to lead an audience toward a particular goal to benefit your business. A mechanical contractor in Alameda, California shows in a simple and basic way the sort of work they provide. Click a photo and more photos of that job come up. This is an effective display of the expertise of the contractor. People often find on-the-job photos interesting for the same reasons guys will stand at a distance for hours while watching a construction project. That is one audience. 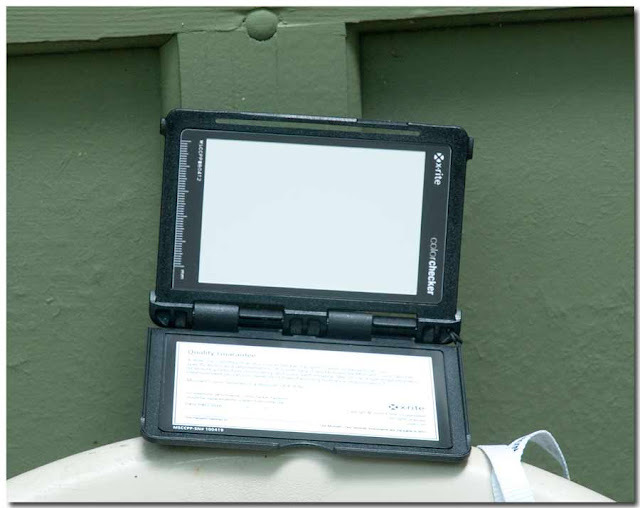 Another audience will be looking for a local contractor to complete a certain task. The photos may help sell the service of the contractor and in that are effective marketing tools. While photos we shoot of your job site may catch the eyes of sidewalk supervisors, the primary audience is the one you want to reach with your business, as dispayed in the job site photograph. A black/white photo often works well for the construction image. In this photo of Aldi'e Grocery in Oak Ridge, Tennessee, framing is shown and b/w may be a good choice in showing lines and structure. Contact us to talk over how photography of the work you do may effectively sell your business to others. In a few minutes we will know if we are on the same page. Caterpillar® is one of the best know manufacturers of earth moving, tree harvesting and mining equipment. 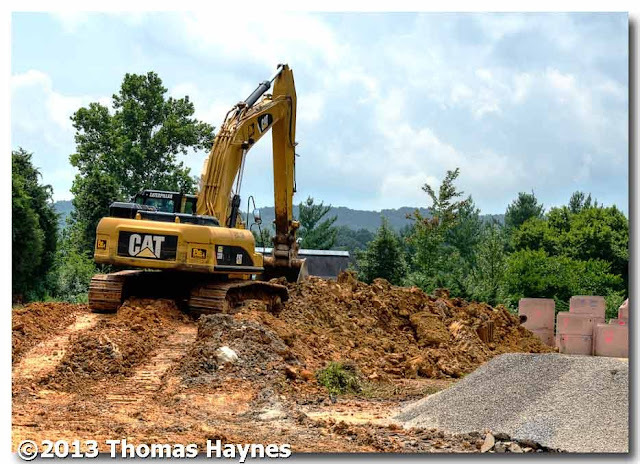 These photos were taken of a job site in Oak Ridge, Tennessee where many older homes have been bought out and the land is being prepared for a Kroger Super Center. The photos were shot when we drove to see the site and were not part of an assignment. These earth working machines did not pose for us. However, with a planned photo session an image may be presented of a strong, adequately equipped and "knows how to get it done" business featuring the crew on the job. The photos below are simply samples of effective presentation Thomas Haynes Photography (commercial) can provide. You get much greater impact with planned photographs showing your crew manning whatever equipment is being used. Posing the equipment here was not going to happen and we wisely kept off the construction area. 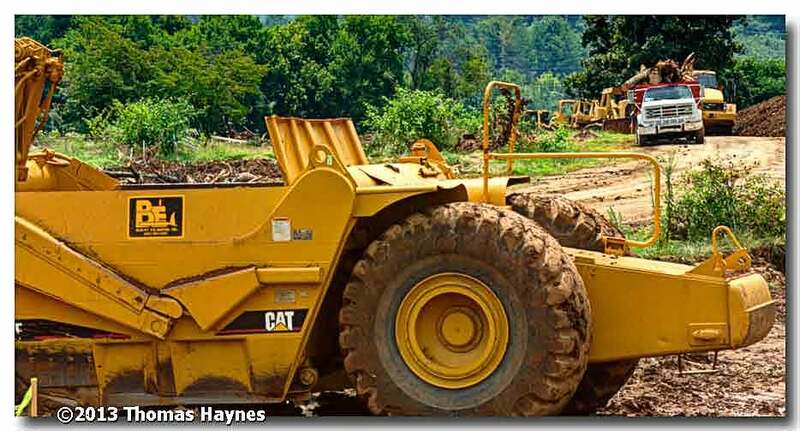 Caterpillar® is well represented in the Kroger Super Center land prep at Oak Ridge, Tennessee. Hydraulic Excavator on the super center site in Oak Ridge, Tennessee. 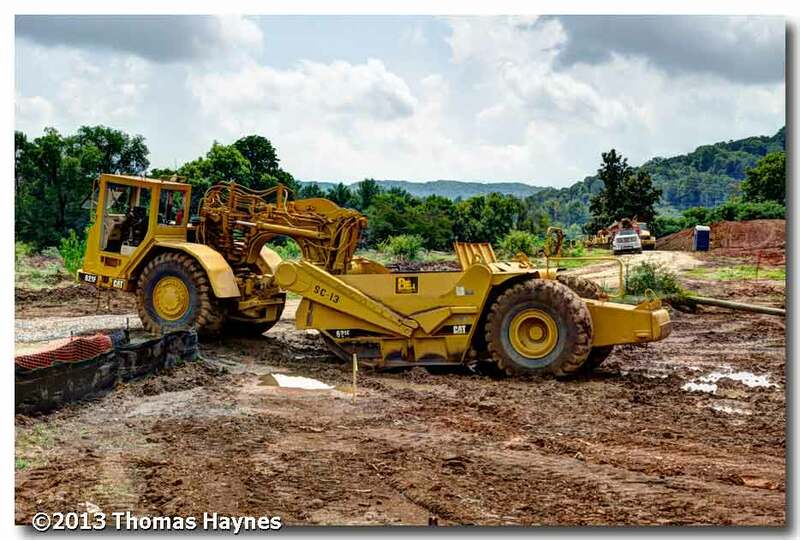 Caterpillar® Earth Scraper at the job site in Oak Ridge, Tennessee. The closer shot revealed Blount Excavating of Maryville, Tennesse is doing this land preparation. As for that large photo for the office wall, yes, we can do that one, too.